Naiad designed Hydraulic Power Packs contain everything required to supply hydraulic power independent of the main engines. Each Power Pack contains one or two electric motors with hydraulic pump(s), an ample reservoir, fluid filtration and cooling, control valves, electronic fluid sensors, and a hydraulic noise silencer all in an attractive package with yacht quality fit and finish. Because the Power Packs are designed and built by Naiad, each unit is custom configured to suit the particular project. This assures that you will not receive a power pack that is over priced, or under powered for your application. Reliable hydraulic power independent of main engines – ideally suited for Stabilisation at Anchor (AtRest®) systems. Assembled and tested in‐house with only the highest quality components. 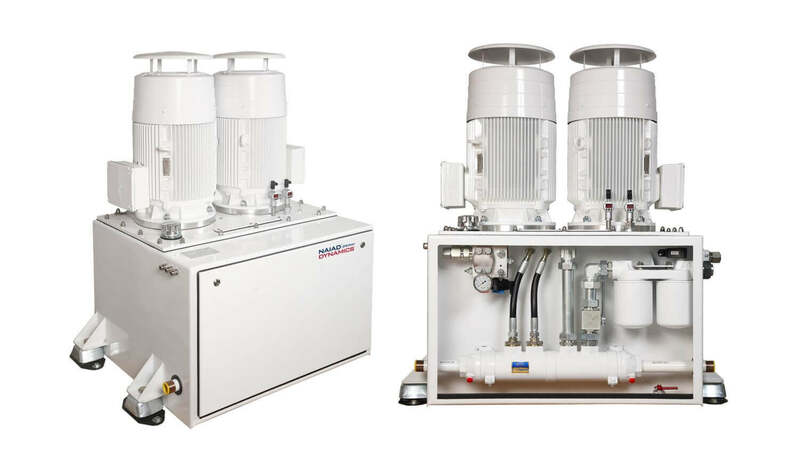 Self‐contained fully plumbed units include motor(s), pump(s), fluid cooling and filtration, valves/manifolds and accumulators and/or silencers. Eases installation, reduces hydraulic lines, and simplifies maintenance. Fluid level, temperature and pressure are continuously monitored with electronic sensors. Alarm signals sent to the DATUM™ motion control system and the ship’s central alarm. Reservoir configured with suction ports when required to supply engine driven pumps.